The Alcatel One Touch Idol Ultra is a capable mid to high end device offering you a decent smartphone experience. It'll stand or fall on the price: if Alcatel is looking to match the likes of the Galaxy S3 and HTC One X+, it'll run into difficulties. The Alcatel One Touch Ultra is the latest device to claim the title of "world's thinnest smartphone" thanks to its incredibly slender 6.45mm frame. 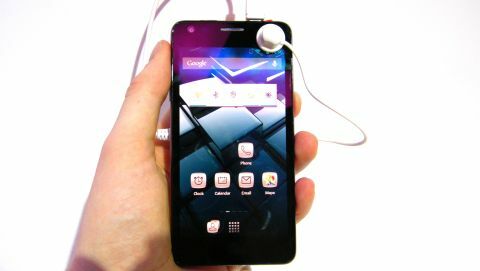 Arriving as the slightly punchier sibling to the One Touch Idol the Idol Ultra features a 1.2GHz dual-core processor, 1GB of RAM and an HD 4.7-inch AMOLED display which sports a 720x1280 resolution. Confirmed for the European market, the One Touch Idol Ultra won't be available in the US and other select regions – although the reason for this is being kept under wraps along with the handset's release date and price. The slim body fits nicely in the hand and the One Touch Idol Ultra feels like a much more premium device than the plain old Idol, with a polycarbonate chassis getting the nod over the cheap plastic of its brother. This provides the One Touch Idol Ultra with a nice weight in the hand, but does mean there's no access to the battery – with a slot for a microSIM located on the right hand side of the device. It's got a small plastic cover over it to avoid dust getting inside, but it's quick tricky to open up as it requires you to push it in at one end to pop out the other – all a bit fiddly if you ask us. Sadly there's no microSD slot on the One Touch Idol Ultra, meaning you're stuck with the 16GB of internal storage Alcatel has crammed inside that wafer thin design. On the top you have the microUSB port and power/lock key although they are switched around compared to the usual layout on top of smartphones – with the lock key on the left which just felt wrong when we came to unlock the Idol Ultra. It's not a make or break issue and we're sure you'd get used to its position after a few days, but it certainly felt odd during the short time we had with the phone. Surprisingly there's no sign of a headphone jack anywhere on the handset, so if you're someone who likes listening to music on their phone, steer well clear of the One Touch Idol Ultra. We can only assume it was ditched in an effort to make this the slimmest phone in the world and we ask, was it worth it? There's touch buttons below the screen for back, home and multi-tasking which weren't always responsive to our prods, leading to some frustrating pokes. On screen though Android Jelly Bean is more responsive and runs pretty smoothly making for an enjoyable user experience – as long as you don't need the touch buttons. Alcatel has put a light skin over the Jelly Bean system, changing the app icons and adding in quick settings to the notification bar. It's certainly more of an aesthetical overlay as the core Jelly Bean experience is still there, although we're not huge fans of the icon design, as it makes the system look a bit cheap. This means a lot of the core Android 4.1.1 features are present on the One Touch Idol Ultra including the stock keyboard, providing a decent form of text input and the large responsive screen makes typing easy. The main web browser is the default Android offering while Google Chrome has also been installed, giving you a choice of apps to access the internet on – although we were unable to put either through their paces due to the lack of a web connection. Another stock Jelly Bean application is the camera, giving you Google's intuitive system which offers fancy features such as panorama and photo sphere modes as well as stalwarts such as white balance, scene modes and video recording. The camera itself is an 8MP offering and protrudes slightly from the rear of the phone and we're willing to bet that at this point the One Touch Idol Ultra is not 6.45mm. There's a single LED flash to the left and you can record 720p video from the camera, while round the front there's a 1.3MP lens, also capable of recording at 720p, but quality will not be great. Shutter speed was pretty quick with the One Touch Idol Ultra letting us take shots in quick succession, although the results were not quite as stellar. The photos we snapped of the Alcatel booth appeared to come out slightly blurry and pixelated, which is disappointing for a handset which is looking to elbow its way into the higher end of the market. The Alcatel One Touch Idol Ultra is a capable mid to high end device offering you a decent smartphone experience. Without knowing its price it's difficult to tell where the One Touch Idol Ultra will be pitched, and if Alcatel is looking to match the likes of the Galaxy S3 and HTC One X+ then it's going to run into difficulties. However if the price is kept suitably low then the One Touch Idol Ultra could be an interesting proposition, even without a hole to plug your headphones into.